Jamie is currently studying Mechanical Design and Manufacture at University of Plymouth, just a stone’s throw away from Cornwall where he lives. 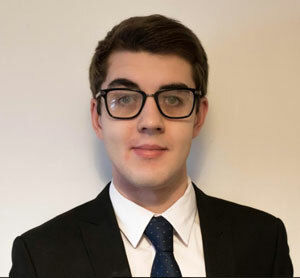 Once he has graduated from university, Jamie aims to be able to move into the aerospace industry and has a placement lined up. His design was developed after having conversations with elderly friends who suffer with arthritis, which made gripping a car steering wheel difficult. Jamie is hopeful that if his design wins and is developed, that just helping one person be able to drive more comfortably will make his efforts worthwhile. A steering wheel designed for people living with arthritis that affects their hands. The main features such as buttons and screens in an average car will be placed onto the centre of the steering wheel, which would limit the amount of time the arthritic driver’s hands are away from the wheel. The point of designing this steering wheel was to take away centre console and steering wheel stalk controls away from their current potions in cars and move them onto the steering wheel itself. The steering wheel is aimed at making steering wheels more ergonomic for disabled people driving and also reducing the amount of times their hands are off the steering wheel. This in turn would reduce the risk of their attention being averted from driving. My steering wheel design it aimed predominantly at people with arthritis. This was encouraged by having family friends who suffer very badly with arthritis and find it extremely difficult to drive. It was also aimed at the aging population who may struggle to find control non-essential driving functions such as the heater or stereo and would overwise result in their attention going off driving. This would increase the chance of them having accidents or collisions. I chose this design because of family friends who have now lost their independence and can no longer drive. I used primary and secondary research to ascertain what functionality my aging friends wanted in their ideal steering wheel as well as asking a local mobility centre what their opinions on the challenge was and opening my eyes to the current products on the market. The steering wheel works by taking the functionality from the centre console, steering wheel stalks and window controls and incorporating them onto the main steering wheel. As well as adding the optionality of flappy paddle gear controls and the addition of a SOS button to phone the emergencies in the event of a crash. In addition, I added a screen into the centre which is aimed at displaying radio or satellite navigation so that they gaze of the driving does not stray to the centre console of cars, where predominantly fixed sat navs are found. Another use for the screen which I would see added would be to have the speed displayed and the option of increasing or decreasing the font respective to what the passenger wants. This would mean that elderly with struggling eyesight would have no trouble seeing the display. For much younger people who suffer from arthritis this screen could be android enabled to allow functionality such as apps like music streaming services. From experiences of myself driving, I chose to add an extra fuel gauge to wheel. This is because I have sometimes found the gauge is obstructed from view by the wheel itself and means that I could not check my fuel level for much of my trip. I wanted to make the wheel easier to grip for someone with arthritis as I have friends who have their fingers locked into a particular position and struggle to grip the wheel. This could be achieved by bespoke grips for that individual to that they have the most natural potion for their hands to rest into. 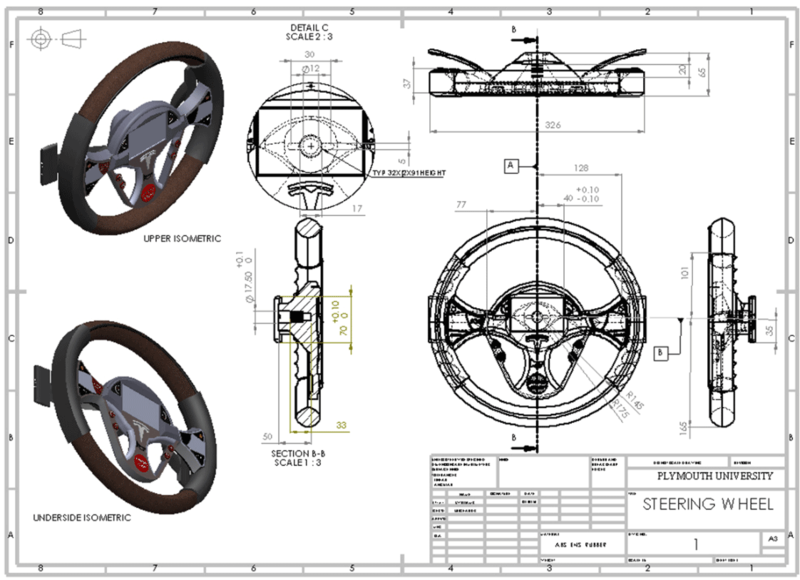 This aim of my design was to have a steering wheel which uses the same universal locking mechanic which most modern steering wheels use, so that my design could be simply swapped over and additional wiring in place to connect all the functionality of the wheel. When implementing the centre screen in the steering wheel I was faced with a dilemma about the air bag being deployed. To avoid it shattering through a glass screen, I envisage the screen being hinged allowed it to fall down out of the way of a deploying airbag. My design is different than any other product design specifically for people with arthritis. At the time when I designed this steering wheel, there was no steering wheel that took so many functions and put them in one place. Most driving aids where grips for the wheel, none of which from my research set out to reinvent the wheel so to speak. Using other car brands as a base line to estimate a cost from I estimate it should most definitely cost under 500 pounds. This estimate is based on looking at top of the line car manufactures who charge a premium on their steering wheel with some of the same functions simply because if the brand. Taking the branding away and adding additional components such as a screen, which conservatively could cost under £50 I can see the steering wheel being not too different than buying conventional steering wheels. A lot of the money would go into researching and connecting the wheel to the car, wiring in all the functions.